Home > Horse Riding For Children > Is Horse Riding Safe for My Child? When parents start to consider horse riding as a pastime for their children, it is only natural that they may have some initial concerns. One of these is bound to be safety and most parents and guardians will find themselves asking is horse riding safe for my child? They may look at the fact that horse riding is a sport which involves an animal which can be unpredictable and volatile at times, not to mention the fact that the child themselves could fall from a great height or at great speed. So, the intention of this article is to allay those fears and show that although horse riding can be risky, children can derive a lot of pleasure and benefits from the sport. First of all, all good horse riding schools will make sure your child has all of the right safety equipment. More than anything else, this means a riding hat. 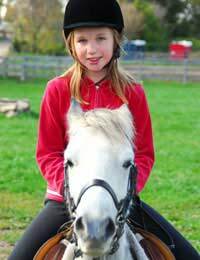 A riding hat is the single most important thing which you can buy for your child when they start riding. If you ask whether horse riding is safe for your child, then you will see how important a hat is. Each child should be bought their own one, brand new and have it fitted properly. Some riding schools will also lend hats out, but as you never have any way of knowing whether the safety of them has been compromised in the past, it is better to buy one from new. One huge benefit to children starting to learn to ride is that the earlier they start, the more natural it will be for them. And if it is more natural for them to ride and ride well, the chances of them having a silly accident are lower. Of course, even the best riders have accidents, but if your child has been riding for a long time and since they were small, they will be more in tune with the horse and what it plans to do. This means they will learn how to avert accidents and collisions, and, if they do fall, they will be far more likely to get straight back on the animal. All sports have their own risks and there is always a chance that if your child plays or learns one, they could get injured. But they will learn sportsmanship, keep fit and have fun – the positives really do outweigh the negatives. Accidents on horses are actually few and far between, and if your child has all the right safety equipment, even if they do fall from the horse, they should be well protected and may well escape with nothing more than a slightly bruised ego. The child will certainly not be as nervous as the parent, so when you do take them horse riding for the first time, the main thing to remember is that you must not let your nervousness be passed onto them. If they realise you are scared, they may become scared themselves, which could result in more accidents and injuries, not less.